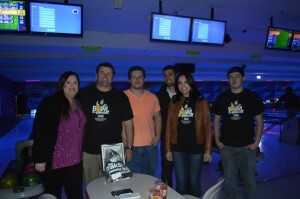 For the third year in a row, our Student Leadership Council hosted their Bowl-a-palooza event. We are so proud of this group of high school juniors and seniors who came together to pull off an amazing event. This year, they raised $3,150 for the House! 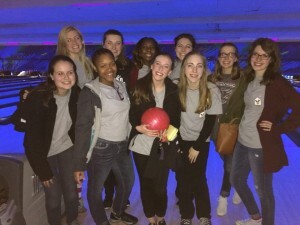 With over 130 bowlers, they packed the lanes at Brunswick Riverview Lanes and everyone had so much fun! Each year this event becomes larger and more successful — and we cannot wait to see how much more it grows in the future. For $20/person, individuals and teams could bowl for three hours with unlimited soft drinks (and, of course, bowling shoes!) and get an event t-shirt. There was also a chance to enter into a raffle for great prizes and get our famous red and white striped socks. 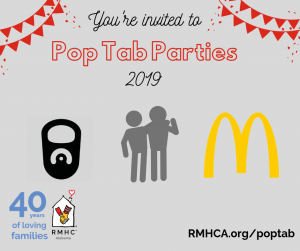 If you were in attendance and took a photo with Ronald in the photo booth, had your picture snapped while bowling, or just want to see the fun — check out our Flickr page. Thank you to all of the donations we received to make the raffle a great addition to this event — Chic Boutique, Mia Moda Boutique, Kendra Scott, Image Arts, Pants Store, Brusters, LJs Thairapy & Boutique, Sweet Frog, Monograms Plus, Rickey Js Bakery, and Restige Uniforms. We are so thankful for all of the amazing sponsors who made the event possible! We cannot express our gratitude enough to The Blue Building Antiques, Timberchase Financial, La Fiesta Mexican Restaurant, Boundless Building Services, Estes Warehouse Tires, Truitt, Tingle, Paramore & Argent, Chase Lake Family Dentistry, Angels Advertising, Small Steps Pediatrics, Serra Mazda, Floor Covering International Birmingham, Niki’s West Restaurant, Balch & Bingham, Birmingham Radiology Group, Nations Outfitters and our local McDonald’s Co-Op.